ORLANDO – When the Orlando Magic opened the season by defeating the Miami Heat, they followed it up with a dispiriting home loss two nights later. Later, they were unable to build upon an impressive win in Boston when they proceeded to drop their next four games. So, when the Magic played one of their most complete games of the season on Sunday and whipped the Spurs in San Antonio, all eyes were on them on Monday to see how they would respond against the lowly Cleveland Cavaliers. Though things looked bleak at times, especially when they trailed by five points with 41.9 seconds remaining, the Magic hung tough and came through with one big play after another down the stretch. 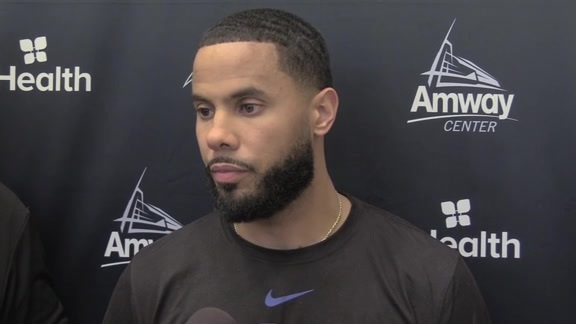 And when Evan Fournier’s calm and clutch jumper swished through the net as the final buzzer sounded, Orlando escaped with a 102-100 victory that gave them consecutive wins for the first time this season. Among the reasons why the Magic have struggled in recent years, one of them has been the squad’s inability to follow up wins with more success. Consistency and momentum are integral parts of the NBA’s marathon-like 82-game, regular season, so the Magic’s ability to string together some success passed as a big victory on Monday night. Orlando (4-6) won in dramatic fashion after it got clutch shots from Fournier and Aaron Gordon, a big block by center Nikola Vucevic and timely steals by D.J. Augustin and Fournier. According to website Impredictable.com, Cleveland had 98.6 percent chance of winning when a rushed Fournier 3-pointer was off line with 33 seconds to play. Still, the Magic were undeterred as Gordon hit a difficult, turn-around jumper, Augustin sank two free throws following his right-place-at-the-right-time steal and Fournier jarred the ball from Kyle Korver and made one of two from the charity stripe to knot the game at 100. Long-time Magic killer George Hill made seven shots in a row at one point in the second half and finished with 22 points, but Vucevic was there to stuff his driving layup with 3.8 seconds left. ``That was a must-win game for us; we had to win that game,’’ said Gordon, who had 23 points, nine rebounds and three assists – the final one on Fournier’s last-second winner. Orlando’s series of clutch plays down the stretch set the stage for the heroics from Fournier, the player who welcomes the pressure of a pressure-packed, final shot. After the Magic broke the huddle from their time out with 1.8 seconds remaining, Fournier went back to head coach Steve Clifford to affirm the path he was to take to get himself in position for the winner. Fournier started the play near the mid-court stripe, circled left around the arc and dove down into the lane. After Terrence Ross ran a decoy flare to the corner, Fournier came sprinting up off a Vucevic screen. The seven-year veteran didn’t panic when he caught Gordon’s inbounds pass, jab-stepping to his right to distract Cleveland defender Cedi Osman. One dribble to his left and Fournier let fly a 24-footer that hit nothing but net. Fournier’s flaw? His right shoe was touching the 3-point line, but it didn’t matter as the Magic escaped with the win and his teammates mobbed him. ``Those are the moments that you want to live,’’ said Fournier following the first buzzer-beating, game-winning shot of his NBA career. 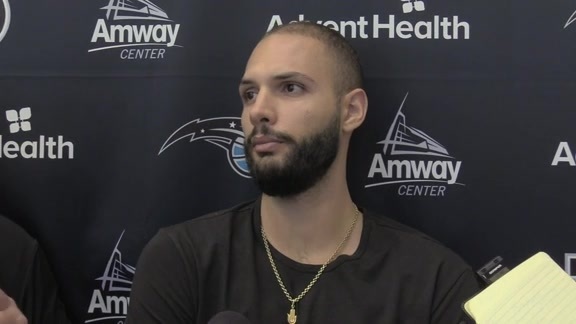 Fournier, who is in his fifth season with the Magic, is well aware of his team’s struggles in the past while trying to string together success. In 2016-17, there was a 36-game stretch where the Magic didn’t win consecutive games and they went 9-27 during that time. Last season, Orlando started impressively at 8-4, but it went the next 41 games and nearly three months without a two-game winning streak and it sat at 17-36 following that drought. 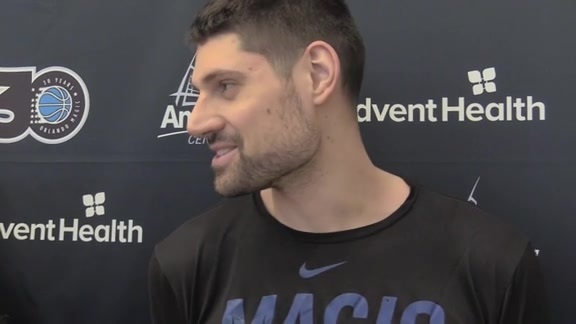 Clifford also knows that all that matters now is how the Magic respond going forward – starting with Wednesday’s home game against the Detroit Pistons, who have streak issues of their own by losing five straight after opening the season 4-0. Clifford wants to see his Magic avoid the lulls of Sunday’s fourth quarter in San Antonio and Monday’s third quarter against Cleveland and put together a consistent stretch of focused basketball.